Before he had the idea of the distilling grappa, Giuseppe Collesi’s father made the Italian liquor in the basement of their home. His father made it for personal consumption — not for profit, but for friends and family. Giuseppe Collesi’s passion started there. For five months out of the year, Collesi’s five-year-old, award-winning distillery, the Tenute Collesi Grappa Distillerie in Apecchio, produces up to 50,000 bottles of grappa that are distributed worldwide. One of only 130 grappa makers remaining in Italy, Collesi makes a home-made style of grappa that takes three times longer than that of his competitors. A 10-minute drive up a twisted, narrow road brings visitors to high atop a mountain in the Marche region of Italy to Collesi’s distillery. Peering through his elliptical-framed glasses, Collesi’s eyes glimmer with an eagerness that got his distillery started. Grappa is a very potent liquor, made from the skin of grapes processed for wine, and is the only alcoholic beverage that is made from the solid part of the fruit. Although there are only a few distilleries in Italy today, the country once dominated the grappa market: the height of the industry was in the 1800s when there were 20,000 distilleries nationwide. This decline from the plethora of distilleries was due to the two world wars and the barrage of other alcoholic products. 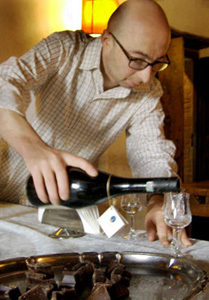 Since the 1970s, the grappa business has restarted in Italy. The Tenute Collesi Distillerie, which opened in 2000, is the first grappa distillery in Le Marche region to come into the market since 1978. Italian distilleries now produce about 40 million bottles of grappa per year. Although other countries produce similar liquor, only in Italy is the name grappa is used. In France this type of liquor is called marc while in Spain it is called orujo. 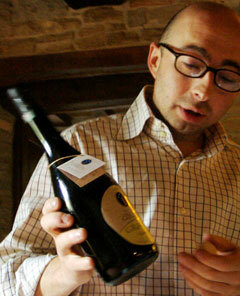 Collesi dispatches internationally even though grappa-style liquors are made in other countries. There is still not as much grappa being produced in the world as there was in the 1800s. “The world prefers quality as opposed to quantity,” said Collesi, who also owns a nearby restaurant and a small bed and breakfast. Collesi’s biggest consumer is Italy, but he also exports to Denmark, England, Germany, Russia, Canada, the Czech Republic and five states in the United States. 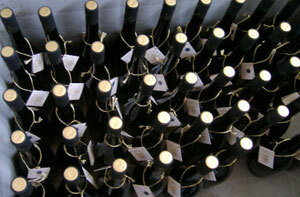 Since there are fewer grappa distilleries, the bottles are high in demand and therefore very expensive. 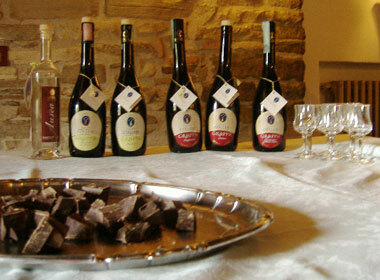 Grappa is often tasted with chocolate because it helps bring out the fruit flavor of the liquor. The Tenute Collesi Distillerie produces four types of grappa: Grappa Di Bianchello, Grappa Di Sangiovese, Grappa Di Montepulciano, and Grappa Di Verdicchio. These different types of grappa have individual tastes, which vary according to the grapes that are used. 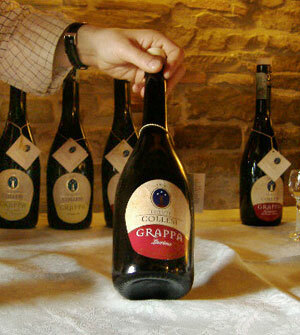 Other flavors of grappa are also being made, using fermented fruits like pears and prunes to give them distinct tastes. The liquor itself is a clear liquid when first made. “It’s gets coloring from the wood in the barrels that it is stored in before it is bottled,” Collesi explained. Hundreds of large, multi-colored barrels used to store grapes line the Tenute Collesi Grappa Distillerie grounds. The grapes used at the distillery come from the Marche region and are stored outside during the months of September and October. The cool fall weather of these months acts as a natural refrigerator to the grapes as they wait to be processed. This climate is important for storing purposes and for preserving the aroma. Collesi’s grappa has won several contests recently. In 2002, 2003, and 2004, Tenure Collesi achieved the del Premio NaTenute Collesizionale national prize and then in 2003 del Premio Internazionale, which is an international wine and spirit competition in London. This unusually successful start, plus Collesi’s desire to carry on the traditions and recipes, keeps the distillery running. In September, a new beer factory will begin operation on the grounds. The beer will be brewed from the Egyptian recipe of the first beer ever made called Corunnu. Marketing and selling for the new brew, however, won’t begin until 2006. Collesi hopes that the beer factory, combined with the already flourishing grappa distillery, will provide a strong future. But having a small company, he feels, works towards his benefit.